" In 2005, Medals4Mettle was started as a result of marathoner runners who award their finisher's medals to others who have demonstrated similar mettle, or courage. Certainly everyone cannot run a marathon, but people who are battle life-threatening illnesses and severe disabilities demonstrate mettle everyday. Marathon runners experience the cheers and support from total strangers as they run through the streets, and these same runners cheer wheelchair competitors that they may pass on the course. 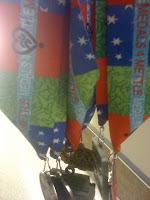 Medals4Mettle celebrates our collective human courage, and our innate desire to reward and support each other as we all face life's challenges." Let's back up for a second though. About a year ago, I ran across the M4M charity via the Internet and saw that there was a Detroit chapter. My medals were just hanging there in my man cave/running room collecting dust and really served no other purpose to me than to avoid hitting them as I rummaged through for gear. Now, of course if you had asked me 5 years ago to donate my race medals, I would have told you no way! I ran "X" race, I earned that medal. Call it the preciousness of youth or simply immaturity, but I didn't see the value in donating something I felt I had earned. Forward motion and reflection left me lots of time to think about what it all means in terms of my running, those medals, etc. I will always have those memories and no longer saw any need to keep those medals. Pass it on, and let someone who is really running a much more difficult race be recognized for their efforts. For an episode of the podcast last year, I was able to sit down with the Detroit chapter president , Joe Burns and donated all of my marathon and ultra race medals at the time. I have continued throughout the year to plug the charity and through the podcast, I have received medals from fellow runners from all across the country including one guy who was able to collect over 200 medals from a race that I have passed on to Joe. Last summer, Joe invited me and a few others to Children's Hospital in Detroit, where we met a representative and donated some medals that would then be passed out to the children. While, I was truly inspired by that opportunity to talk up the charity, yesterday's opportunity left no doubt in my mind that every runner/cyclist/triathlete who has participated in an endurance event should donate to this charity at least one medal. University of Michigan C.S. Mott Children's Hospital yesterday provided me and several others, the opportunity to meet and present children who are participating in their own endurance event that none of them chose with some medals. These children and their parents did not choose their event. They did not choose to have a closed head injury, or seizures, or compressed vertebrae, or burns, or have their twin brother not make it through the birth process. However, in every one of those kids eyes, I saw mettle, I saw courage, and I saw an indomitable spirit that said, they are going to persevere. They were going to keep moving forward. I hope the small token acknowledging their efforts brought a smile to their face and a reminder that they are too endurance athletes in their own right. After yesterday, I have no reason, to complain or mire in the choices I make regarding signing up for an endurance event or an injury I might incur as a result. I made that choice, these children did not. Thanks to a fellow runner and listener of the podcast for this fun little test to see if you are a road or trail runner. What is your score? 8. Which do you fear more on runs, getting shot by hunters (+1), or getting shot by gangs (-1)? 12. On most of your runs, do you often have to decide whether to cross against the red light? 13. How long does it take a fresh pair of shoes to lose that "new look" two weeks (-1), one week (0), three days (+1) one day (+2), two hours (+4)? 7 - 12 = A trail runner in spirit. now get the hell out of the city and move to where there are some trails!